Gifting has historically made up a large portion of DVD sales. However, as watching movies or TV series has shifted from DVDs towards digital services, it has become harder to “gift wrap”. Sony Pictures are looking for a way to boost sales by recreating the warm glow of giving or receiving a viewing experience. How can you make gifting digital films a more rewarding experience? 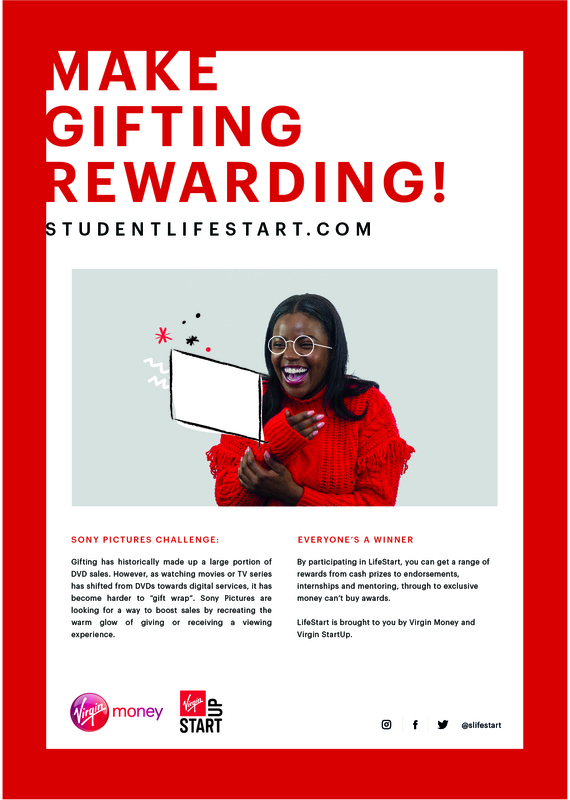 Pitch to Sony Pictures and be considered for the Sony Pictures Home Entertainment internship programme. Receive vouchers or Sony headphones. Bag of home entertainment goodies plus a movie bundle. Everyone who wins a challenge gets a personal LinkedIn / CV endorsement from a senior manager at Virgin. Virgin Experience Day voucher worth £100. Apply online before 29 October. Students can apply as individuals or teams.